When I arrived at Twin English school, it was easy for me to make a lot of friends. English courses are really friendly and each new week, the teacher asks everybody to introduce him or herself so everyone can get to know them (news students start courses every week). For our first trip we went to Brighton. It is a very lovely, vibrant, colourful and fun town in the south of the United-Kingdom on the seaside, just one hour from London by train. We met up one Saturday morning at London Bridge Station and travelled together. When visiting places in England, it very interesting to travel by group and it can save you a lot of money: travelling as a group to Brighton cost us £10 return each instead of £20. As soon as we left the train at Brighton station, we saw the sea. It was amazing! I love the sea, the sand, the gulls... it breathed holiday around us! Unfortunately the weather was not so good to go swimming, or even to put one toe in the sea! You have to remember we are in England, the weather changes every hour, so we just spent some time on the beach and relaxed. At mid-day we decided to find a place to have our lunch. We began to pace up and down in Brighton streets and lanes full of sweet shops. Finally, we sat down in a typical pub: we drank a local beer (of course) and ate a pie. Is this a traditional English lunch? No clue, but it was delicious! During the afternoon we continued our exploration of Brighton. 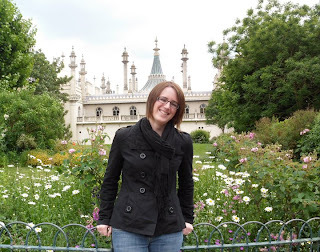 We visited the Royal Pavilion (the palace of George IV, which is so nice), had a look at the Brighton Museum and Art Gallery and spent some time at Brighton Pier, which is full of attractions. After this full day, we drank a last beer before to come back to London: during the return nobody talked, everybody slept but before we fell asleep we exchanged our email addresses to keep in touch. I spend such a good time with my friends there that we planed to visit Oxford two weeks later.